I often found the Minotaur legend disturbing and strangely moving. Minotaur, the bull-headed monster, resided in the labyrinth built on the command of King Minos of Crete, subsisted on tributes of young boys and girls, and was finally slain by the Athenian hero Theseus, who invaded his lair as one of the new sacrifices. 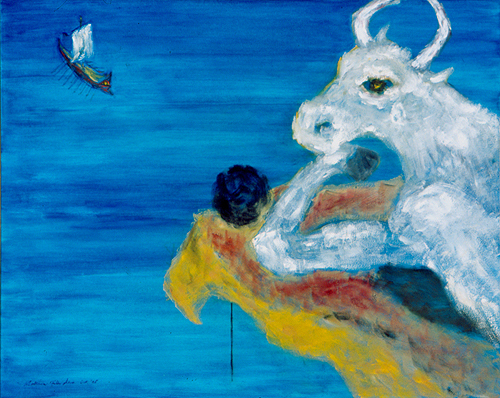 The strangest aspect of the legend was that Minotaur had a head of a bull, which was not a natural carnivore, therefore it would not be far-fetched to imagine how sickened he was by his own savagery, thus I treated this subject in my oil painting, Minotaur. My Minotaur was not a personification of usual monstrosity; rather, a sensitive being, trapped by his monstrous nature beyond his own control, he eagerly awaited his slayer/liberator, so as to rid himself of the misery. There, a hoof under his chin, my Minotaur pensively watched from a precipice the approaches of the Athenian boat, while holding the ball of threads, to be given to Theseus later by the willing princess Ariadne as means to aid his existing from the foul maze after the deed. A large tear oozed out of his eye but it was not a bitter tear, rather a willing resignation and submission.